Slot machines have been around since the late 1800s, with the introduction of “Liberty Bell” the first slot machine featuring spinning reels by designer Charles Fey. Slot machine designers such as Bally Manufacturing and Herbert Mills played key roles in the advancement of slot machines. Early slot machines were used as trade stimulants by merchants and gave sticks of different types of chewing gum, golf balls and cigars instead of cash payouts. IGT was the first to introduce virtual reels and random number generators which helped to further the popularity of slots. The introduction of five reel slots by Australia-based Aristocrat Technologies began the start of many of the video and bonus events that are used by manufacturers today. While a large majority of modern-day slot games feature video representations of reels, there are still computerized slots that feature mechanical reels. If you are reading this guide it is probably because you want to know more about this amazingly addictive pass time. If so, then you have come to the right place because this guide is going to tell you all there is to know about slots machines. In the following pages the reader will get to learn about the rich history of slot machines, how their unique design came into being, and the complex programming that goes behind the making of some of the most addictive and well known slot machines known to man. Here, you will also find the secrets to increase your odds at winning against the slot machine. Slot machines are relatively easy to understand and play. The minimum bets that are waged while playing slots is inexpensive. Slot machines whether played at the casino or online offers a higher chance of winning big even with a small wager. Both real-life casino and online slots are fun to play. The Term “slot machine” was initially used for all automatic vending machines along with gambling devices as well. It was not until the 20th century that the term became associated only to gambling devices. It is hard to believe that slot machines have been around, entertaining folks for more than 120 years. That’s because slot machines have become a regular feature of all modern day casinos around the world. 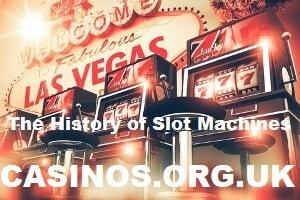 The following are some interesting facts about the history of slot machines. The first slot machines that were built did not pay cash prizes. The first three-reel slot machine that was built in the US paid off a maximum jackpot of just half a US dollar at the time. The new generation computerized slot machines give bigger payoffs. Much of the ingenuity and inventiveness that’s gone into making modern day slot machines are the result of international game makers. While online slots have gained immense popularity amongst players nowadays, slot machines were invented before computers. In fact, the first slot machines were mechanical and clockwork machines. Charles Fey invented the legendary Liberty Bell back in 1895, but evidence suggests that coin operated gaming devices were around before the invention of the Liberty Bell, yet modern day slot machines are linked to the invention of the Liberty Bell. As a San Francisco-based mechanic, Fey had invented a game which had three spinning reels with a handle at the side, and a slot where the player inserted the coin. The display featured a single payline that ran across the middle. Slot machines were clearly inspired by table games, which is why the reels of that game features hearts, spades, and diamonds, three of four suits found in playing cards. The reels also featured horseshoes and you guessed it…the Liberty Bell. The maximum payoff came by lining up three Liberty Bells symbols. The first jackpots were just 10 nickels or five cent pieces, which means that the total jackpot was only of half a dollar which is tiny as compared to the thousands that are won by slot players today. Other popular slot machines that Fey invented included; the Klondike, the Draw Power, and Three Spinde. The first slot machine that was designed by Charles Fey was simple yet elegant, with none of the bells and whistles of today’s popular slot machines. The three-reel design in slot machines of today is powered electronically which is a far cry from their predecessors that worked on cogs and gears. While Fey’s design was not called a lot machine at the time, if placed in a casino today, it would easily be recognized as one. Charles Fey invented the first game that featured spinning reels, but there were other wagering machines that were played by inserting coins around before the Liberty Bell. A poker-based spinning machine was designed by Brooklyn-based Sittman and Pitt in 1891, which featured 50 playing cards on five spinning drums each of which had 10 card faces, to display a five card poker hand on each spin. The better the hand, the more a player would win. 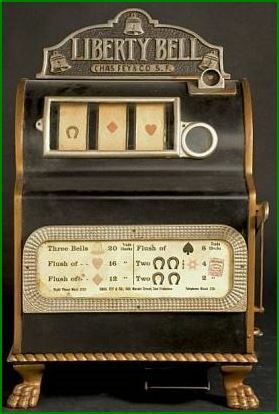 While both devices had some differences and similarities in them, both required the player to pull a lever, which led slot machines to be known as “one-armed bandits.” Another similarity in both these games was that players were required to insert a coin in order to start playing. One of the main differences between Charles Fey’s Liberty Bell and the device that was designed by Sittman and Pitt was that Liberty Bell worked on a mechanism that dispensed coins automatically depending on the results of the spin, unlike the design by Sittman and Pitt which did not use that mechanism. It was perhaps this difference that led to the immense popularity of the Liberty Bell over the Sittman and Pitt device. At the time, other popular games were color wheel games which had vertical slot wheels that were all divided into different segments of colors. The player had to wager on which colors would show on each of the reels with a top indicator. But, it was Fey’s design which would revolutionize slot machines and change the way slots were designed forever. While both manufacturers started mass producing slot machines at around the same time that were then placed in saloons, bars and other venues, the Liberty Bell is credited with the initial slot machine boom. It was Fey’s inventive design that would pave the way for other slot machine designers who would come up with their own versions of the three-reel slot machines. Other companies soon began designing their own versions of slot machines and the slots industry was truly established. While slot machines that paid off money were considered illegal in the United States until 1931, when the State of Nevada legalized casino gambling, monetary payoffs could only be made discreetly. During that time, slot machines were being used under the guise of ‘Trade Stimulators.’ The following are some of the ways in which these trade stimulators were being used by smart merchants. Trade stimulators were used by merchants who placed them on counters in an attempt to attract more customers. These trade stimulators used merchandise to payoff winners rather than money. Sticks of chewing gum became one of the favorite payoffs and the logo of the Bell Fruit Gum company soon became the inspiration for the bar symbols found in many of the slots today. The chewing gum symbol inspired other well recognizable symbols on the reels of slot machines such as watermelons and cherries. While the game at the time was being played with legal prizes, as in, no cash payoffs, there were certain secret locations where the players could exchange the merchandise they won for cash. 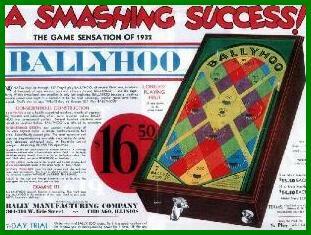 In 1932, Lion Manufacturing a Chicago-based company was founded which designed the world’s first pinball game which was called “The BallyHoo.” Soon afterwards, the company’s name was changed to Bally Manufacturing, which was later on changed to Bally Technologies and moved to its new headquarters in Las Vegas. Today, the company is known as Scientific Games, but back in the day, Bally has positioned itself as the only major competitor to the slot machine which was designed by Mills a few years before gambling was legalized in Nevada. Bally’s first foray into slot machine, and Mills territory was with its trade stimulators. Called the “Bally Baby,” this trade stimulator was placed on countertops and paid off in reward cards which could then be exchanged for sticks of chewing gum. The first slot machine that was developed by bally accepted two coin denominations which were nickels and quarters, both of which had their own slots where the player placed the coins. In 1940, Bally introduced “Hi Boy” which was an upright slot machine and allowed Bally to firmly establish themselves as the number one slot machine manufacturer in the world. By the 1960s, almost 80% of all slot machines that were being used in casinos across the United States were manufactured by Bally. Bally introduced electromechanical slots in the 1960s, along with the coin hopper. The coin hopper enabled higher payoffs since the game did not have to be stopped in order for an attendant to make a payoff by hand. The new technology that was being introduced to its Money Honey slot machine gained immense popularity and attracted many players because of the significantly higher payoffs. At first, casinos in Nevada weren’t that open to it because the new electric design was so different to the traditional slot machines. But, that wasn’t the case for British players who loved the new concept. It wasn’t long before Bally was shipping their new design to Britain. The popularity of “the new slot experience” abroad was eventually felt by casinos in Nevada, which allowed Bally to cement its place as the number one slot manufacturer in the world, putting the competition such as Jennings, Mills and Pace out of business. Until 1949, slots were being played by the hundreds of thousands across the US. But, in 1950 Estes Kefauver a senator formed a congressional committee to stamp out corruption and zeroed in on gambling, putting slot machines at the top of his list. In 1950, the Johnson Act, a new federal law was passed that intended to wipe out the slot business. Since Federal law is applicable to matters that cross state lines, the Johnson Act made it illegal for slot machines to be transported interstate, or any state where slots were deemed illegal. During the same time, many states passed similar laws that made slot machines illegal, which led to vast numbers of slot machines being seized and destroyed. But, there was one state where slot machines were not illegal, and that was the state of Nevada. This led to most slot manufacturers packing up and moving their operations to Las Vegas and Reno. What manufacturers at the time were not aware of was the Johnson Act had one loophole. It described the slot machine aka “The poster child of evil” as a device that had spinning reels with symbols on them. This led to the design of a new revolutionary game by an enterprising young man. In 1955, Zeke Wolf came up with a slot game that was designed using pinball parts, and did not feature reels. Instead, the new game design called “Jumbo” featured flashing lights, circus symbols, and pain out in replays. Zeke Wolf was convicted for breaking the law when a shipment of Jumbos were seized by the authorities. Wolf appealed to the Chicago Court of Appeals which led to the conviction being reversed on the grounds that the Johnson Act did not apply to his design since it did not feature spinning reels, which was a common feature on all slots at the time. This ruling was being observed by many slot manufacturers who also contributed to the cost of Wolf’s trial. In the end, the result led to a glorious period in slot machine history where all kinds of electronic slots were being manufactured that varied in complexity and payoffs. Some of the slot manufacturing companies that stood out during that time were Keeny, Bally and Games. And while they never really caught on in Nevada, their popularity spread like wild fire across the US and abroad. William Silas “Si” Redd is more popularly known as the “King of Slots” and credited for creating profitable coin operated machine routes through the Mississippi and Illinois, and he did it all while America was going through the Great Depression. Redd’s journey began at the age of 17 when he accepted a used, 1932 “Goofy” penny pinball machine as payment on a $16 loan he had given to a friend. That machine launched Redd on a career that would last three-quarters of a century. In 1942, Redd was offered to buy the New England distributorship for Wurlitzer jukeboxes. While that stint didn’t last long, it did provide Redd with the opportunity to amass a wealth of knowledge and contacts within the country’s growing gambling industry, which would later on lead to him becoming the most important person in the gambling industry. Later on, the president of Bally Manufacturing Company Bill O’Donnell hired Redd as their distributor in Nevada. Redd would move to Las Vegas in 1967 and start Bally Distributing Company. Redd went on to make a lot of money as distributor of Bally slot machines and decided to venture into manufacturing himself. After Bally Manufacturing Company bought the venture, Redd founded the company Sircoma (SI Redd COin MAchines) by purchasing a couple of local going concerns, and more notably, Fortune Coin, the manufacturer of the first ever video slot machine. This resulted in a court battle between Redd and Bally, which ended in both parties agreeing to a sensible alternative. That Bally would not sell video slots and Redd would not sell slot machines featuring reels for five years. When video poker became a huge success Redd’s company went public, sold its shares and changed its name to International Game Technology or IGT. While Redd did agree to not selling reel based slot machines, that didn’t stop his company from manufacturing them, and once the five year period was over, Redd’s new company, IGT released a full range of electronic slot machines that featured stepper motor reels. Online slots that feature random number generators and virtual reels. This made for a huge variation when it came to the odds and also paid off huge jackpots to the winners. IGT introduced the Megabucks game which was the first to be linked with different casinos, offering cash payoffs worth millions. What set IGT’s slot designs apart from their fiercest competitor Bally was that unlike Bally’s slot machines, IGT’s design was more reliable, required very low maintenance and was more versatile. This eventually resulted in IGT taking over the slot machine business from Bally. Later on, a small company known as Anchor Gaming designed an add-on feature for slot machines and tha game was called Wheel of Fortune. IGT was quick to recognize its potential and licensed Wheel of Gold. IGT then worked on an arrangement with the popular television game show Wheel of Fortune, making it one of the most popular slot games since the 90s. Today, Armed with detailed intelligence on a gamblers’ habits, the game designers at IGT are able to tailor-make each slot machine to appeal to specific types of players. Take a look at any casino floor and you will notice a significantly higher amount of video slots as compared to the ones with mechanical reels. Since the slots that were being developed in the 80s to mimic the three-reel experience failed miserably, something new had to be brought to the table to attract more players. Video slots were introduced for the first time in the US that featured video representation of the reels. The first slot to have video spinning reels was called ‘The Game Maker’ and was released in 1994. The game not only included a slot but also video Blackjack and video Poker that were housed in a single unit. The immense popularity that the Game Maker enjoyed was unheard of at the time, and still remains one of the single most influential innovations to happen to slots. Other slot makers such as WMS and Aristocrat came up with their own inventions with bonusing slots which helped the rise of video slots. Nowadays, video slots casinos have taken the slot machine experience to a whole new level in the UK and the rest of the world. It’s no wonder that video slots make up for up to 80% of slots that are in casinos today.